A new WSU campus in Everett tops an eventful year that will make its mark in local history. Each of these stories made major headlines in 2017, and the impacts will have a ripple effect in Snohomish County for years. Washington State University opened its Everett campus. Boeing started 777X production. Ground was broken for a commercial air terminal at Paine Field. The campus brings a major employer and attracts talent and youth to Everett. The plant ensures Boeing will retain a presence in the county for years to come. The terminal adds a vital transportation link that will help attract future businesses. The significance of each will be measured in the years to come. Very few things can change the face of a community like a college campus. That’s what Snohomish County leaders are banking will happen with WSU opening its doors in Everett. There’s an energy and excitement with a campus and the students it attracts. The fact that colleges double as a major employer is also a bonus. The four-story, $64.6 million glass-and-brick building opened in August. The inaugural class of students started classes just days later. It’s small today. Only about 500 students are taking classes through WSU and its partner universities. But the campus building is big enough to grow to twice that number of students in the future. There already are discussions about the campus growing beyond this first building. Travel to any community with a college campus — Bothell, Bellingham, Tacoma — to see what the institution means to the surrounding community. Everett’s WSU campus is offering programs to complement existing businesses in the community — mechanical, electrical and software engineering, for instance. Some of the students taking those classes could begin their own businesses, creating the jobs far into the future. Boeing opened its first manufacturing plant in Everett 50 years ago. With the new 777X program, it could be here for another 50. The aerospace company started assembly of the new wide-body jet at a state-of-the-art plant at the Everett factory at Paine Field. Test flights are expected in 2019, with delivery to airlines in 2020. The 777X builds on some innovations of the 787 that first flew in 2009. The aircraft will have the longest composite wings of any plane in the skies. Boeing agreed to build the 777X in Everett after securing concessions from union machinists and state tax breaks that are expected to save the company an estimated $8.7 billion over several years. The company has said that 3,250 employees are expected to work on the program by 2018. Boeing workers realized the importance of the moment for the company as well as Everett and Washington. “I just wanted to be able to be a part of something that will help Boeing continue on for the next century,” rear spar mechanic Nick Just said. It’s been a controversial topic for years in Snohomish County. Should a commercial air terminal open at Paine Field? 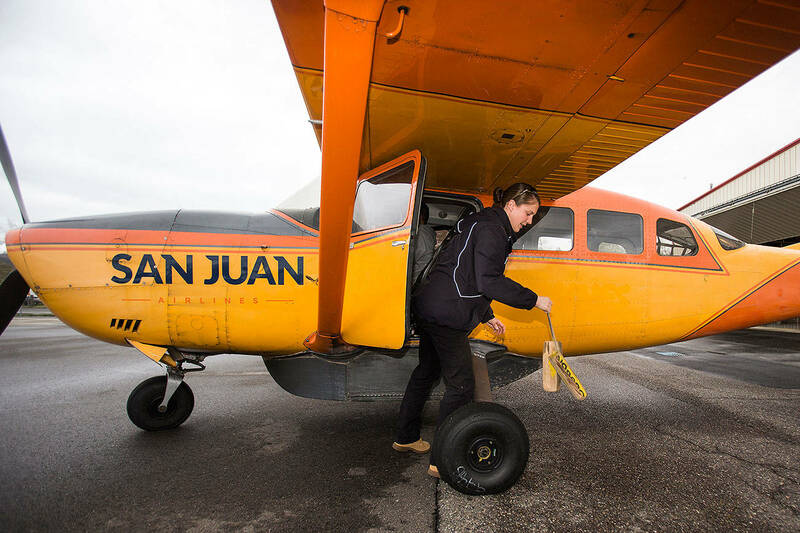 This year, privately owned Propeller Airports got the OK to build the terminal. Alaska and United airlines both signed up to start flying out of Everett as soon as it opens. The scheduled opening is September. All of a sudden, travelers will no longer need to drive to Sea-Tac — a trip that can take a couple of hours or more from Everett. That’s appealing for business travelers who make up a large number of the passengers on many flight. It won’t be the deciding factor if a company decides to locate in Snohomish County or chooses to relocate elsewhere. But it could be one of the factors in any decision by a business. Lobsang Dargey will leave a legacy in Everett. During the recession, at a time when little development was occurring in the city, Dargey built a Potala Village, a mixed-use apartment and retail building, in downtown Everett. Then he started building Potala Place, another mixed-use project just a few blocks away. He had other projects in Seattle and the Eastside. From 2012 to 2015, Dargey and associates raised $153.6 million from 282 Chinese investors. He was gaining a reputation for getting things done. But he was also defrauding investors and misusing tens of millions of dollars on trips to casinos and on personal purchases, including jewelry and a luxury home. In August, Dargey was sentenced to four years in prison and agreed repay $24.1 million to investors. For the first time, the median price for a homes climbed past $400,000 in Snohomish County. It broke that barrier in April and remained there through the fall. Location, of course, dictates prices, with homes closer to Seattle in the south county costing far more than homes in the north part of the county. But everywhere, home sale prices are higher now than before the recession. That’s led to questions about a housing bubble. One statistic that leads economists to downplay bubble fears: The area has seen a rapid growth, with more than 100,000 people moving into the county just in 10 years. That’s almost like adding another city of Everett. The Tulalip Tribes is one of the largest employers in Snohomish County. And many of those employees work at the tribes’ two casinos in Tulalip. This year, the tribes announced plans to spend $100 million on a replacement for Quil Ceda Creek Casino, the smaller of the two. The new casino will be 110,000-square-feet on 15 acres across the street from the existing casino, at 6410 33rd Ave. NE in Tulalip. The casino will feature new entertainment and dining options, a spacious gaming floor and a 1,200-stall garage with a fast-ramp access. It’s not every day that a company moves its headquarters to downtown Everett. And not very many companies are like Funko. The toys-and-collectibles maker went from a nondescript warehouse in a south Everett business park to the former Trinity Lutheran College, bringing a couple hundred creative workers to the city core. The company also opened a flagship store, a destination attraction with giant-sized figures of pop culture characters, such as Marvel’s Spider-Man, Disney’s Malificient and Chewbacca of “Star Wars” outside. On the inside are worlds devoted to the best and geekiest of pop culture. Funko held a party for the grand opening, attracting celebrities and thousands of people from all over the world. That wasn’t all for this homegrown business. Funko’s CEO and president, Brian Mariotti, also took his company public in early November. Ten years ago, the Port of Everett worked with a developer on an ambitious plan to bring hundreds of condos to the Everett waterfront. Then the recession hit, and those plans fell apart. With the housing market recovered, the port is again looking to bring people and businesses to the waterfront. The port wants to redevelop the central waterfront, and the project gained traction this past year as companies signed on to build a hotel and apartments and bring a mix of restaurants and shops. The waterfront development and scores of homes already being built along the Snohomish River could add hundreds of homes to the city of Everett on opposite sides of downtown. The Everett Clinic was the largest independent medical group in Washington. The 250 physician-shareholders agreed to sell the medical group to kidney dialysis giant DaVita for $405 million. The deal was completed in 2016. The Everett Clinic kept its name and joined a corporation with deep pockets to fund expansion in the Puget Sound area. Just more than a year later, DaVita decided to get out of the medical group business. It struck a deal, pending regulatory approval, to sell all its medical groups, including The Everett Clinic, to Minnesota-based health insurer UnitedHealth Group. What this means for The Everett Clinic and its providers and patients remains to be seen. Malls have been taking it on the chin in recent years with the rise of online retail. The Everett Mall is no different. The Macy’s store at the mall closed in the first few weeks after the 2016 holiday season. The storefront remained empty later in 2017. At least one company saw opportunity. California real estate investment firm Brixton Capital announced in October that it had purchased the mall for an undisclosed price. The 490,949-square-foot mall, at 1402 SE Everett Mall Way, includes Sears, Regal 16 Cinemas, Burlington Coat Factory, Party, LA Fitness and other businesses. Jones Lang LaSalle Americas was selected to manage and lease the property.